Using colorful cartoons, illustrations, and an easy-to-read approach, The Human Body in Health and Illness, 4th Edition makes it fun to learn anatomy & physiology. Clear, step-by-step explanations provide all the information you need to know, so concepts are easy to understand even if you have a limited background in the sciences. 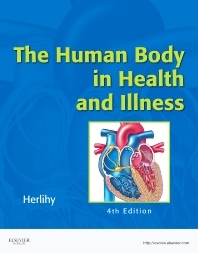 Written by well-known educator Barbara Herlihy, the book begins with a basic discussion of the human body and cellular structure and moves toward genetics and the greater complexity of the human organism. It breaks down complex concepts and processes into digestible chunks, and new features such as Re-Think and Go Figure! help you apply what you've learned to common problems in patient care. Unique! Original, colorful cartoons use humor to reinforce content, making it more accessible and user-friendly. Original, full-color illustrations complement the text and simplify both fundamental and complex concepts. Key terms are listed in chapter openers and defined in the glossary. A summary outline at the end of each chapter provides a useful study tool. Unique! Do You Know boxes discuss pathophysiology issues or provide a historical connection to A&P. Unique! Disorders of the _ System tables summarize specific disorders related to individual body systems for easy reference. Sum It Up! reinforces and summarizes key topics. As You Age boxes describe how aging affects human anatomy and physiology. An updated Evolve companion website provides access to posttests, animations, an audio glossary, and additional Do You Know vignettes.